Trial Incubator Program – put your hand up who wants in? You are invited to express your interest in a Trial Incubator Program run through 6 Degrees. The trial will be a 10 week program with kick-off expected to be at the start of July 2018. Startup ideas are all around us and the more we are at work the more we can think of. Unfortunately, it is much harder to actually quit your day job and start a company. This trial incubator program aims to give you, an aspiring startup founders the knowledge and skills you need to evaluate if your idea is worth investing more blood, sweat and $$ into. This trial incubator is designed as a valuable pre-accelerator program to greatly improve your chances of being accepted into a startup accelerator in the future. An information session will be convened for all interested participants in late June. To express your interest, please contact email fiona.barden@chcc.nsw.gov.au with your name, contact details and a brief description of your business or idea. Or for further details email or call Fiona Barden on 6648 4082. The Digital Innovation Challenge is the only event tailoured to STARTUPS, entrepreneurs, and intrapreneurs on the Mid North Coast. It is aimed at assisting our local startups to learn how to pitch, find co-founders, launch their product to the press, share their stories, reach early adopters and influencers and so much more. The Coffs Coast has a wealth of entrepreneurs waiting to be unleashed on the national and global marketplace. This event will help to uncover them and inspire them to continue on their journey. We aim to connect them with people who can mentor them and, for two lucky Live Pitch Final prize winners, the Challenge will provide the money and support to make it happen. Who should attend? aspiring entrepreneurs, seasoned entrepreneurs, professional service providers keen to hear about the next big thing, accountants, investors, supporters of innovation, tech heads and non-tech heads, people with half-baked ideas (in preparation for next year’s challenge), futurists and realists alike, just no devil’s advocate’s allowed. While grazing on some delectable finger food wander the stands in Startup Alley to uncover the up and coming businesses of the region. Hear their elevator pitch, test their product, discuss their market, share your feedback and help make them the next local success. We will also have opportunities for speed-dating or “office hours” with some of our mentors. Businesses are jumping on board every day to be in the alley, a selection of who we have lined up so far. If you want this exposure for your startup contact us. This is the big show, the time when our selected finalists battle it out on stage in front of you the audience and our expert panel to show us their best pitch. The well deserving winners will share in a prize package worth over $150,000. You can be a part of the audience and watch the action unfold, support your favourite startup and learn what investors and mentors are searching for. You can’t have a decent Startup event without an after party! Thanks to Softlayer we can debrief, network and solidify those connections and ideas that have been sparked throughout the day. The Digital Innovation Challenge is the only event tailored to STARTUPS, entrepreneurs, and intrapreneurs on the Mid North Coast. It is aimed at assisting our local startups to learn how to pitch, find co-founders, launch their product to the press, share their stories, reach early adopters and influencers and so much more. The Coffs Coast has a wealth of entrepreneurs waiting to be unleashed on the national and global marketplace. This event will help to uncover them and inspire them to continue on their journey. We aim to connect them with people who can mentor them and, for two lucky Live Pitch Final prize winners, the Challenge will provide the money and support to make it happen. Who should attend: aspiring entrepreneurs, seasoned entrepreneurs, professional service providers keen to hear about the next big thing, accountants, investors, supporters of innovation, tech heads and non-tech heads, people with half-baked ideas (in preparation for next year’s challenge), futurists and realists alike, just no devil’s advocate’s allowed. Cost: $20 *light refreshments included and exclusive invitation to the after party. KEYNOTE SPEAKERS: We have brought to the region a selection of startup experts, regional entrepreneurs who are smashing it and local talent to inspire, engage and demonstrate all the ins and outs of startup land. STARTUP ALLEY: While dining on some delectable finger food wander the stands in Startup Alley to uncover the up and coming businesses of the region. Hear their elevator pitch, test their product, discuss their market, share your feedback and help make them the next local success story. LIVE PITCH FINAL: This is the big show, the time when our selected finalists battle it out on stage in front of you the audience and our expert panel to show us their best pitch. The well deserving winners will share in a prize package worth over $150,000. You can be a part of the action. Is your startup looking to take that next big leap forward? This year the Digital Innovation Challenge is going bigger and bolder! 18 June is set as the date for the LIVE PITCH CHALLENGE event where the finalists get to battle out in front of judges and open audience for a massive prize package of over $150,000. As an added opportunity for local entrepreneurs who aren’t in the finals or who have already launched we have also incorporated a Startup Alley so they can showcase their business. We want your company to be our next local success story. 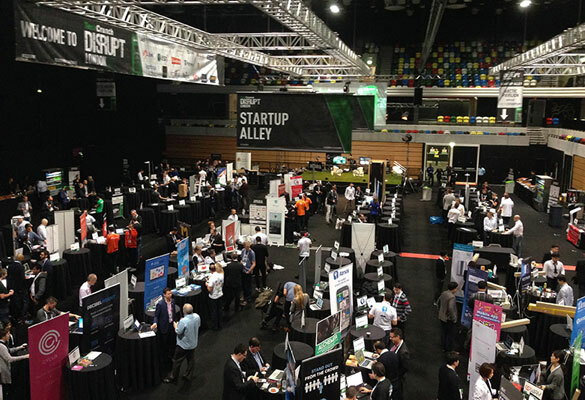 As a participant in the Startup Alley you get a spot to display in Startup Alley for one day during the show for two company representatives. This opportunity is for you and your team to use the space in the Startup Alley anywhich way you need. You could use it to launch, gain the attention of a co-founder, gain customer insights, it is up to you. Your startup can be at any stage, be it MVP/ product launch / scale. So, why should you take the leap and display in the Alley? Startup Alley is a great way to get your company in front of the local business professional services, investors, innovators and members of the press in attendance at the Challenge Day — who can potentially help take your company to the next level. And when you’re not networking in the Alley, you will get to take in the morning masterclass session, hearing some awesome speakers as well as watching our local startups competing in the Digital Innovation Challenge. Digital Innovation Challenge Day takes place on Saturday 18 June at the C.ex Club Coffs Harbour, and we can’t wait to see you and your company there. Space is limited in our Startup Alley so if you want to be considered please contact Kristina Cooke via email or 6648 4089 for the full low down. Are you sitting on a fantastic business idea but not sure how to get it off the ground? Take the Telstra Business Centre Coffs Harbour Digital Innovation Challenge and get expert support plus the chance to win from a pool of over $150,000 worth of prizes. “Last year’s first Digital Challenge was a phenomenal success and there’s huge interest in the 2016 event already,” said Coffs Harbour Mayor, Councillor Denise Knight. The Challenge is open to any type of business improvement solution or market need. For example, it can be a business2business solution, consumer application or a social enterprise. There are two massive prize packages with a combined value of over $150,000 for the winner and runner-up. The packages include $120,000 of credits for startup cloud computing requirements from IBM company Softlayer, plus up to $6,000 cash and Business Assistance packages from ETC (Enterprise and Training Company Pty Ltd), three month mentoring packages from Pollenizer – providing access to some of Australia’s most experienced startup mentors – and six months desk space at the Six Degrees Coworking Hub in Coffs Harbour’s Innovation Centre. The Challenge is sponsored by Telstra Business Centre Coffs Harbour, Mid North Coast Local Health District, Softlayer, ETC, Coffs Harbour innovation Centre, Coffs Harbour Chamber of Commerce, Bellingen Shire Council, Coffs Harbour City Council and Nambucca Shire Council. If you have an exciting, imaginative digital solution for business, this is your chance to pitch for the prize money and support you need to make it happen. Entries open from March 8 2016 at 9am and close on May 29 2016 at 5pm. Finalists will be announced on 3 June with them delivering their final pitch live on stage on 18 June. A series of events and workshops are planned to support the development of entries so check out www.digitalinnovationchallenge.com.au for full details. A selection of startup experts will deliver special masterclasses to fine tune your business idea and show you the steps available to make it happen. It’s time for your startup to shine, No matter what stage you are at: from “before the beginning”- testing the product-market fit, ready to launch or already live. THis is your chance to pop up your shingle and use this event to your advantage. You can start to test your assumptions, promote your brand, identify your collaborators, seek out mentors or financiers. Brendan Yell from Softlayer’s Catalyst program will also be available for on the spot mentoring. If you want to reserve a spot for your startup contact Kristina. Selected finalists will each have the opportunity to pitch live in front of our expert judging panel and other Challenge Day innovators. Competing for the chance to win one of two awesome prize packages. Enter the Challenge now. Time for our winners to celebrate and our local entrepreneurs to network their socks off. A relaxed networking event for all our Digital Innovation Challenge pitchers, attendees, presenters and supporters.